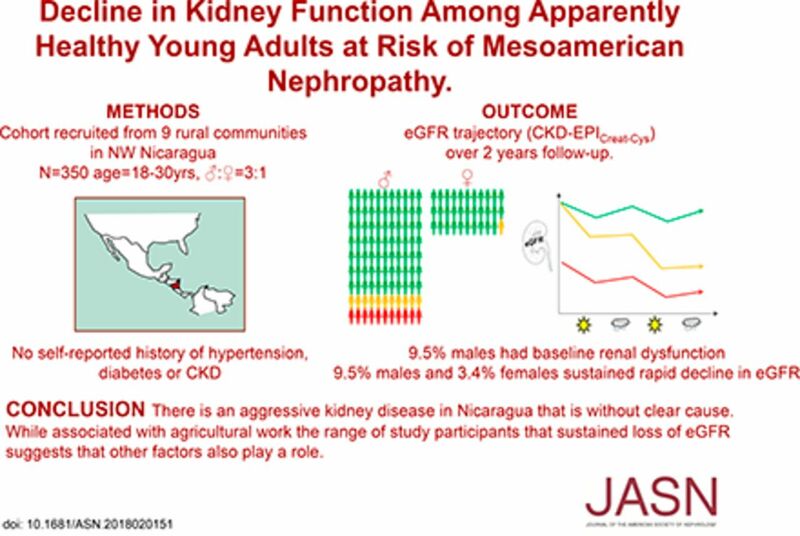 Background Epidemic levels of CKD of undetermined cause, termed Mesoamerican nephropathy in Central America, have been found in low- and middle-income countries. We investigated the natural history of, and factors associated with, loss of kidney function in a population at high risk for this disease. Methods We conducted a 2-year prospective, longitudinal study with follow-up every 6 months in nine rural communities in northwestern Nicaragua and included all men (n=263) and a random sample of women (n=87) ages 18–30 years old without self-reported CKD, diabetes, or hypertension. We used growth mixture modeling to identify subgroups of eGFR trajectory and weighted multinomial logistic regression to examine associations with proposed risk factors. Results Among men, we identified three subpopulations of eGFR trajectory (mean baseline eGFR; mean eGFR change over follow-up): 81% remained stable (116 ml/min per 1.73 m2; −0.6 ml/min per 1.73 m2 per year), 9.5% experienced rapid decline despite normal baseline function (112 ml/min per 1.73 m2; −18.2 ml/min per 1.73 m2 per year), and 9.5% had baseline dysfunction (58 ml/min per 1.73 m2; −3.8 ml/min per 1.73 m2 per year). Among women: 96.6% remained stable (121 ml/min per 1.73 m2; −0.6 ml/min per 1.73 m2 per year), and 3.4% experienced rapid decline (132 ml/min per 1.73 m2; −14.6 ml/min per 1.73 m2 per year; n=3 women). Among men, outdoor and agricultural work and lack of shade availability during work breaks, reported at baseline, were associated with rapid decline. Conclusions Although Mesoamerican nephropathy is associated with agricultural work, other factors may also contribute to this disease. Heat-related chronic kidney disease mortality in the young and old: differing mechanisms, potentially similar solutions?